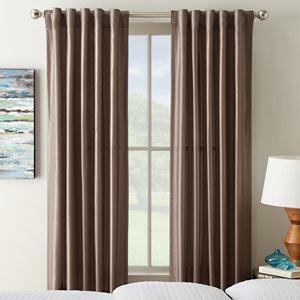 Whether made from fabric, faux wood, or smooth or textured PVC, verticals from Select Blinds are a budget-friendly way to cover extra wide windows and sliding glass doors with the right style to match yours. And all of our vertical products are 100% cordless to keep young children and pets safe. Draw Types – Wave your magic wand to open and close your custom verticals in the direction and style that meets your needs. 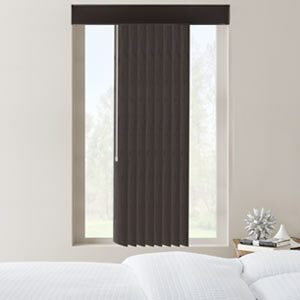 We offer three different draw types with our cordless vertical blinds. Order your verticals with the wand on the left or right in a one-way draw, split stack, or center stack configuration. Materials – Fabric vanes in a variety of colors and patterns give windows a softer, more modern flow. For an updated designer look, try one of our fabulous fabric panel tracks. These wider, sleek sliding panel shades operate on wide-panel tracks for a unique alternative to standard 3-1/2” vertical vanes. 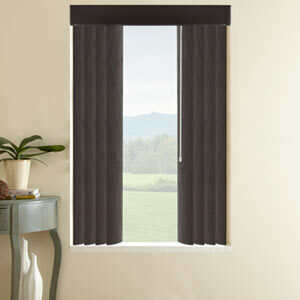 For a rich, elegant look that’s also budget-friendly, faux wood vertical blinds made of long-lasting PVC are fabulous. They have the look of real wood, but are more affordable, durable, and moisture and humidity-resistant. Looking for verticals that are easy to clean and care for? Classic smooth or textured PVC vanes are economical and stand up well to every-day use. Light Control – Sliding doors can let a lot of light in. 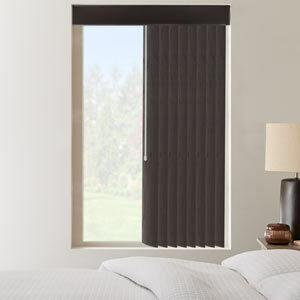 Consider using a light-filtering, room darkening, or blackout vertical product on them to help protect furnishings from fading and to give you more privacy. More light control can also help reduce energy costs. Custom Sizing – One size does not fit all when it comes to verticals. Since every sliding glass door is different, we offer verticals in standard sizes to extra wide widths up to 191”. 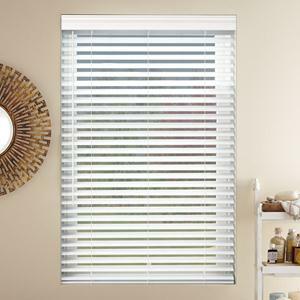 Ready to update your patio doors and sliding doors with more modern, custom vertical blinds? Check out our verticals buying guide and these helpful measuring instructions to see how easy they are to order here on SelectBlinds.com!